It wouldn't be prudent to start a new business without a business plan, and it wouldn't be advisable to throw your business up on social media without first developing a marketing strategy. While the specific recommendations for each network continue to evolve, the underlying principles should continue to guide how you choose to approach social media for business. The temptation is that if you are going to market your business through social media, you must have an active presence on every network imaginable. Unless you have limitless time and resources, however, this is simply neither advisable nor feasible. There are tools and tactics available to cross-post across multiple platforms, but it is generally a better idea to custom tailor the message for each platform. To this end, you'll achieve greater impact when you choose the right social network and do it well than you would if you do a mediocre job across several platforms. Take some time to think about who your ideal customer is and where your target demographic tends to congregate on the web. When developing your social media strategy, it is very important to develop a consistent visual style. This is true from a branding perspective in general, just as much as it is through with social networks specifically. Think about the brand colors, fonts, and messaging you'd like to use and make sure you stick to that design aesthetic with all of your visual posts. The way you present your company on your Facebook business page should be consistent with how it is presented on Instagram and Pinterest. 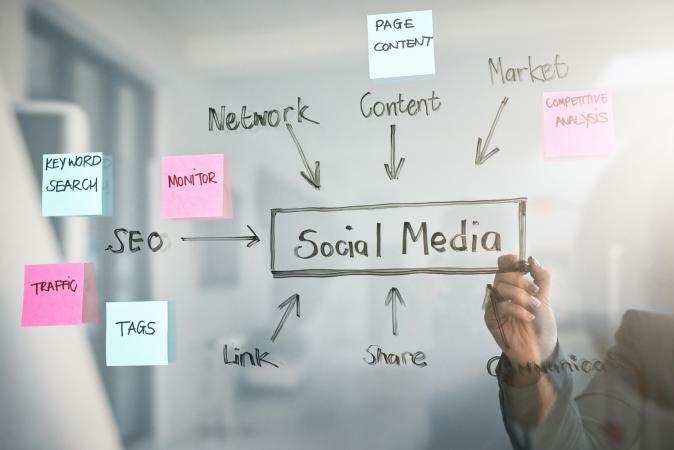 Just as you should be maintaining detailed records for all your revenue and expenses, as well as all the data related to customer relationship management, the same is true when it comes to your marketing efforts on social media. When you spend money on traditional advertising, you'd like to see a return on that investment. Social media is no different. So when you are developing your strategy for approaching social media, take the time to consider what your actual objectives are here. Consider such metrics as follower growth, engagement rate, referral/conversion rates, and revenue generated through social media marketing. By using tracking links and other tools, you can gauge how much your business is actually benefiting from your efforts online. After you've decided on an overall design aesthetic and you've defined your main objectives, take the time to create an effective social media content plan. The key here is consistency, so decide on a schedule you know you will be able to maintain. Are you going to post new content on Instagram each day? If so, start planning out the type of content you want to share. Are you going to have themed days, like Tech Tuesdays or Flashback Fridays? You need to have this content primed and ready to go before those days roll around each week. As with more traditional forms of marketing, there are a myriad of ways to approach marketing on social media, too. You can focus most of your efforts on organic growth by explaining the benefits of your products and services. You might try to attract new followers and customers through public outreach events or giveaways and contests. Consider if you would like to dedicate some budget toward social media advertising, not only in terms of boosting visibility on networks like Instagram and Facebook, but also through tactics like influencer marketing. Set out a plan for at least the next several months, measure your performance, and put together an even better plan for the quarters and years to come. While engagement rates aren't necessarily related to how many accounts your business profile follows on social media, it is especially important for small businesses to connect with their fans in an authentic and respectful manner. Use social media not just to broadcast your messages like a billboard, but rather as a platform for an open, two-way conversation. Talk to your followers just as much as they talk to you. That is the most important element of any successful social media strategy.